In this career workshop, it was the 4th session that was held about this topic. There were 3 more of its kind before it. In this workshop, it spoke of career planning and tools students can utilize to find out more about the career they are pursuing or even finding more about majors that they didn’t even consider. This is because some people are uncertain of what they want to major in, leading them to be more open to more options of what they want to major in and have a career in. In the workshop, they gave us informational pamphlets and worksheets to help us start our journey within Baruch. The important ones were from the Focus 2 Assessment and the LinkedIn ones, but that was my opinion. This is because LinkedIn is a resource that we are going to use if we ever go into the professional world. I, myself, has heard of the website, but never found a use for it. It seems like in the next couple of years, I will have to be on it quite often if I am to find good places that contain the career I hope to pursue. Another thing I found useful within this workshop was that it spoke about social meia usage. This part of the workshop told us about being careful on what we post on social media. It told us that one of the first thing that employers do is search up who they are trying to employ online. This makes it such that they will have an idea of who they are going to be working with. This is because a resume can’t supply everything about a person. An example of this is someone with a perfect resume, but prefers working alone or has a nasty personality while the company is looking for someone everyone in the company can work with. That would mean that the person applying won’t seem like the best fit that the company needs and will look for someone else. 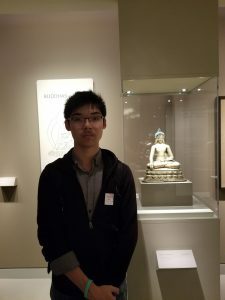 For this blog, it was around the time that I went to the Rubin Museum. I went to this museum to do my Art History Assignment at the time. This assignment was one of the very first assignments that came out for Art History. I wasn’t much of a fan of why I needed to go out and explore around. This experience, however, brought some limelight to my conserved thinking. This is because exploring is basically what college is about. Even though I reside in New York City, I had never even visited or even heard of the museum. This would mean that it was already a new place to visit. I always stayed at home and never liked the idea of going outside. However, when I did go outside, I tried to explore as much as possible. With this activity, I saw an opportunity to explore around the area around campus. This is because this place was quite close to campus. However, it was a little walk away. It was at a small part of a block. That is why it had to be on separate floors in a small building. Visiting this museum was quite a different experience than other museums that reside within Manhattan. This is because the main museums are the Museum of Natural History and the Met, which are way bigger in comparison to the Rubin Museum. Even though the main point of the visit was to do an assignment for a class, I still see it as an opportunity to be able to explore the many things that were within the city I live in. I didn’t stay within the building for long because there really wasn’t much to do and wasn’t quite that much to look at. I also don’t see myself continue pursuing something that related to why I went to that museum. Visiting the place was interesting,but not something I would probably do again. The first club that I had joined arriving at Baruch was VSA, otherwise known as the Vietnamese Student Association. I was introduced this club by my upperclassmen friend that was part of the e-board. I attended their first general interest meeting and managed to get to know the whole e-board. All of them were very kind and very welcoming. This lead me to continue going to the events of the club. This picture was taken towards at the end of one of the events at the club. The event was the Summer Roll and the Language Workshop. There we learned how to make a traditional Vietnamese dish as well as some of the language, mainly items on a menu in a Vietnamese restaurant. In the photo is one of the e-board members, James. He is the Vice-President of Events within the club. 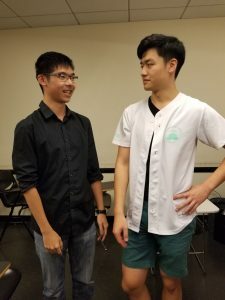 He was one of the first people that introduced himself at the general interest meeting. The club provided a gateway to meeting all kinds of interesting people. Even though I am not Vietnamese, I find that this club will be very fun.